I love reading. My father is my inspiration on me having cultivated this habit. He has a good collection of books and he reads something new everyday whenever he gets a break in the day and before he goes to sleep. He even motivates me to write a topic on anything that I've read. This reading and writing habit has grown and as a result of it, some of my articles were published in few monthly magazines. My friend Priya and I used to send multiple stories and would eagerly wait for the next month's magazine issue to check our article has been published or not. In the year 2010, we won an award from a famous children magazine for contributing many articles. My writing habit stopped slowly, when I moved to Chennai. Initially I was longing to read, missed my favorite library, the books but slowly adopted to the busy running life of this city. I almost stopped reading except my school and college books. That inturn degraded my writing skills. Now, I feel sad that I almost lost the capability of writing good articles. Couple of months ago, I just wanted to resume my reading habit and a bit of motivation from husband, just completed a book yesterday. Feeling little happy that I acheived my goal to some extent. It is all happened , because husband got me a kindle app in my phone and suggested good books. Hope my reading interest remains sustained for a long time. Fine. 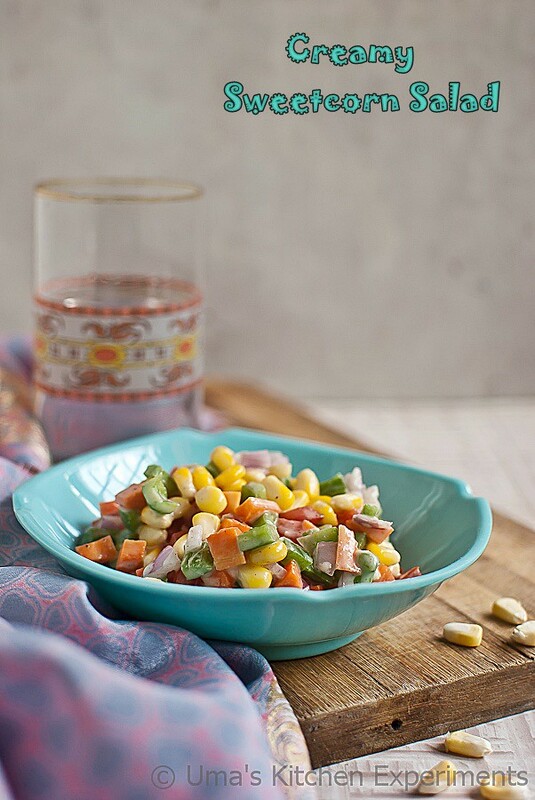 Let me come to today's recipe - Creamy Sweetcorn Salad. Usually before the week starts, I align my post one by one for the upcoming week (most of the time) and as per this schedule, seasonal South Indian gravy was supposed to be posted today. 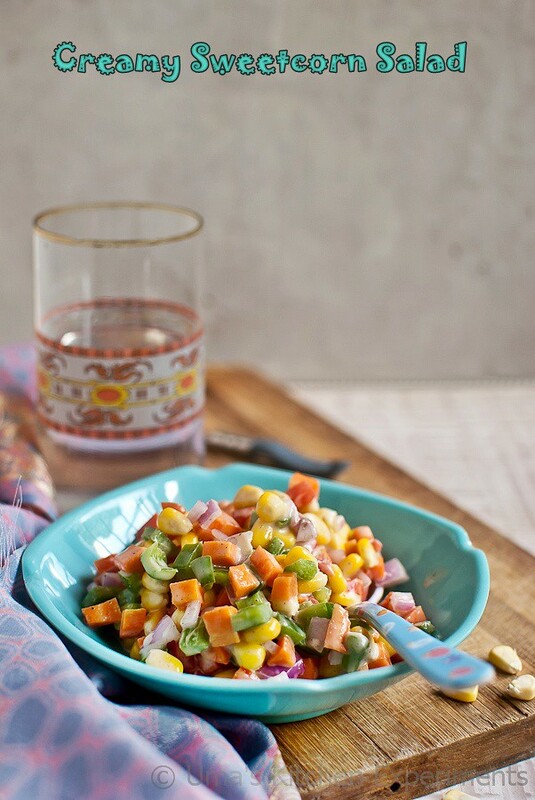 But after making some minor changes in the plan, I am here to present a healthy, creamy salad that is treating you now. Hope you all like it. 1) Wash the sweetcorn and steam it for 5-7 minutes.You can also place the sweet corns in a microwave safe bowl with water to cover the sweet corns and microwave it for 7-10 minutes or until it becomes soft and well cooked. The time might vary depending on the type & power output of microwave. 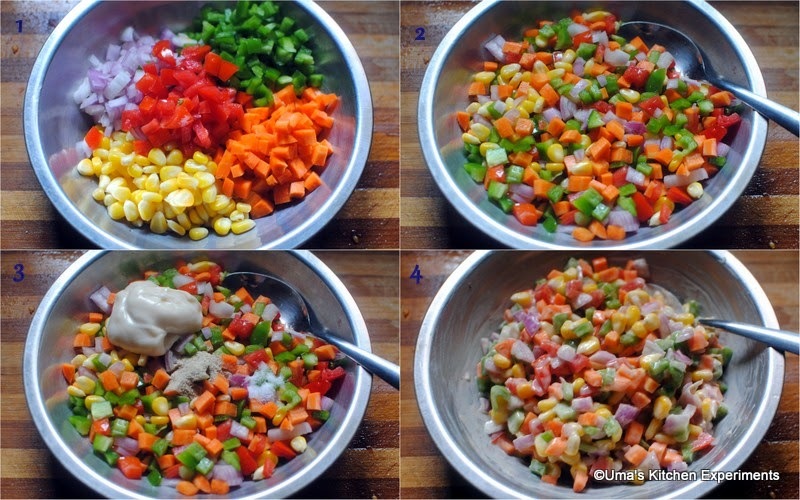 Once cooked, transfer the sweet corns to the small mixing bowl. 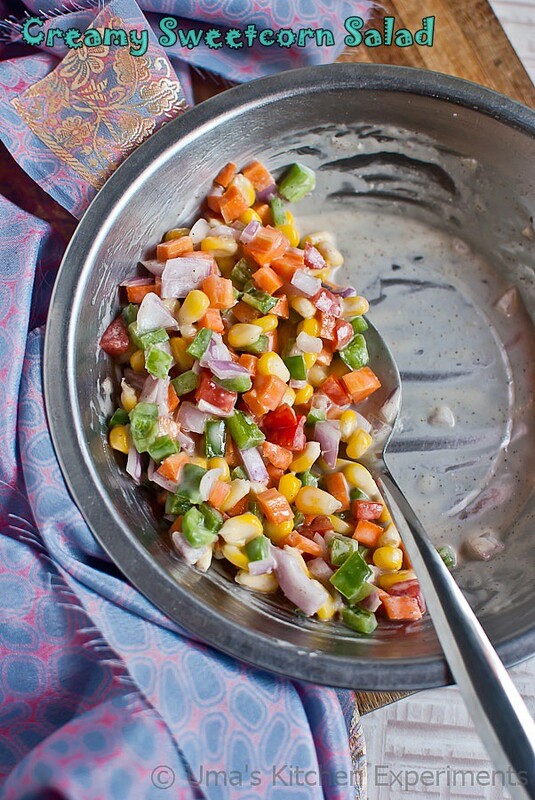 2) Meanwhile, finely chop rest of the vegetables. 3) Mix all the ingredients in the mixing bowl. 4) Add salt, ground black pepper powder and Mayonnaise of your choice. Mix well. 1) Add Mayonnaise just before serving. Otherwise the water content that gets released from the vegetables may change the taste of it and also loose the creamy texture. 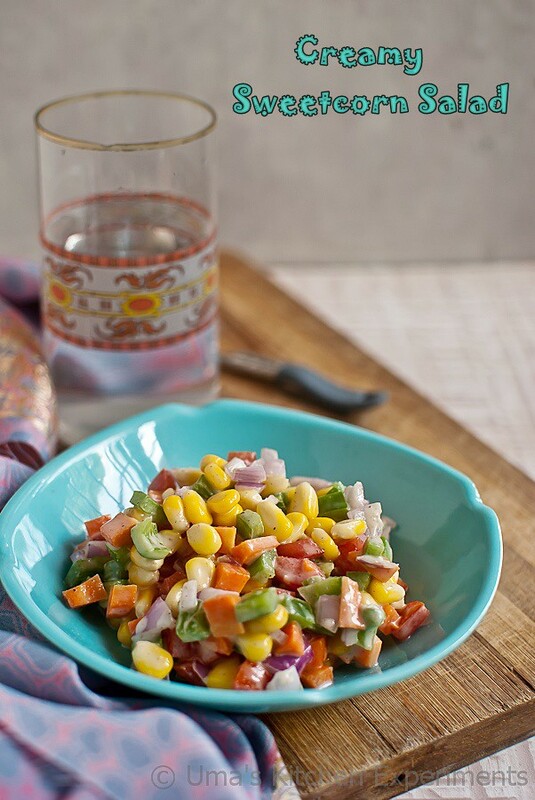 2) Any choice of vegetable can be added to this salad.